So, you’re looking for a butcher knife. Guess what, I will present you with 5 of the best butcher knives in this very post. As you can see, butcher knives should be durable as repeated blows are sometimes required when cutting through bones and tough meat. How Do Butcher Knives Look? How Many Butcher Knives Should You Have? Butcher knives come in different looks, sizes, and designs. The most common design looks like a hatchet – this model is also called cleaver knife. Butchers working in slaughterhouses usually use this type of knife in their work. While appearance is important, the use and functionality of a butcher knife are even more important. Certain designs are applicable for butchering, skinning, chopping, etc. And since multi-purpose butcher knives have also become popular, there are now all-around butcher knives that can also be used on other ingredients like fruits and vegetables. A classic butcher knife is designed to be quite large. It also comes with a broad blade. And of course, it’s very VERY sharp since it’s meant to make clean cuts on tough meats and bones. 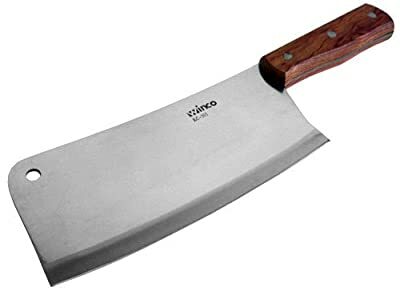 A Cleaver knife is a type of butcher knife. It’s built to chop through bones, so it’s well constructed and heavy-duty. As an all-around kitchen knife, its broad blade can also be used for crushing garlic. A Cimeter knife looks a lot like a sword (in shape and appearance) – but it’s shorter. 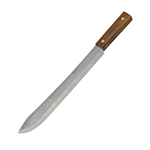 This type of butcher knife is best used for skinning and boning animal meat. Butcher knives in different forms can also be used for specialty applications. You can use a fillet knife, a boning knife, a carving knife, a skinning knife, etc. (as needed). You see, butcher knives are not only useful in the kitchen – you can also use them on your outdoor adventures (fishing, hunting, camping, and more). You can use a regular fillet knife or an electric knife for deboning fish. This also works in removing the skin of fish. When choosing a boning knife, get one that’s easy to hold. Also, you don’t necessarily need a long one, even if you’re working on a large piece of meat. What’s really important is that you can accurately control it as you go on your work of boning an animal carcass. In order to do the job well, a carving knife should be easy to maneuver. This is the type of knife used for carving (cutting) roasted turkeys. If you are a hunter, a skinning knife type of butcher knife should be one of your go-to tools. It makes the job of dressing dead animals faster and easier as well. Don’t just get any knife that’s labeled “butcher knife” as it may not really fit your needs. Since a butcher knife is a special type of knife, consider the following points below. 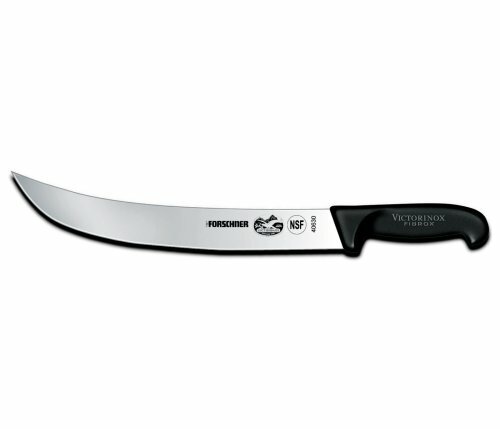 Quality – Remember that butcher knives are tasked to handle tough jobs, so they should be just as tough. Therefore, look for a model that won’t easily break when performing its job. Size – This will depend on what you intend to use your butcher knife for. If it’s meant for butchering animals, the length of the blade is very important (it should be long enough for this task). If it’s just for general outdoor use (like cutting meat and slicing wood) a knife with a short blade will do. Style – Consider the style of knife for a particular task. There are specific styles of knife for butchering, skinning, and chopping bones. Keep the blade sharp – Regular sharpening of knives is part of their maintenance. This will also prevent damages as a sharp blade can easily cut through food (and things) without too much pressure. 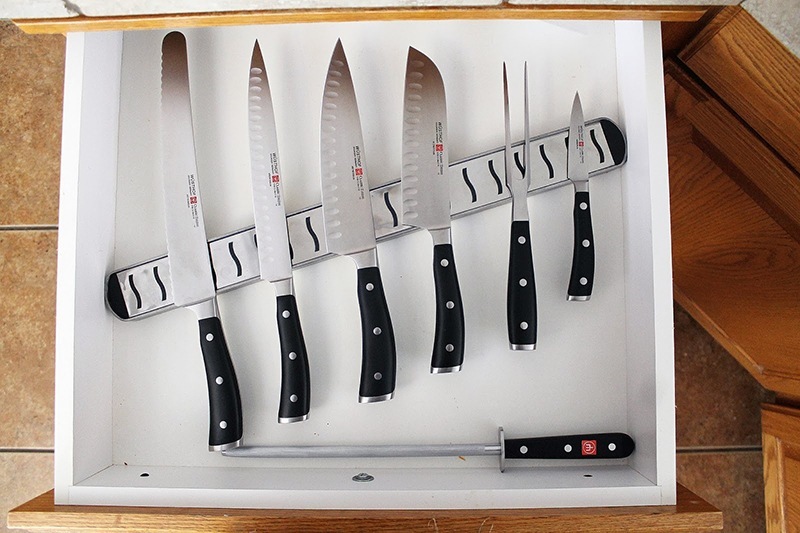 Store the knife properly – Proper storage of knives requires not keeping them in drawers (where they can accidentally cause injuries). Knives are best kept in sheaths or arranged in a wood block. Using a blade guard is also practical in caring for your knife (for safety and for keeping the blade sharp). Clean and wash with care – Although some knives are dishwasher safe, it would still be better if you hand wash them. The strong detergent used in a dishwasher can cause corrosion and early wear and tear in your knives, you know. Handle with care – As a bladed tool, handling knives requires special care. In the case of butcher knives, these are meant to be very sharp – that’s why you should be extra careful when using them. As much as possible, always keep the blade facing away from you during use. Use the knife properly – To keep your butcher knife sharp and in tip-top condition all the time, use it wisely. In the kitchen, avoid using chopping boards that are made of glass as these will quickly dull your knife. When outdoors, use it only as intended. I advise against getting knives in packages if you’re not going use some of the knives anyway (yes, even if they come cheap in a pack). However, if you find a pack of butcher knives that will be useful to you, I say go ahead and buy it. As already mentioned before, butcher knives have different purposes. And so, you might need more than one. There are times when using a short one is more practical, and there are also times when longer knives are needed to perform a task. Therefore, it’s not really wise to just limit yourself to owning just 1 butcher knife. What I would suggest is getting a number of butcher knives or a butcher knife set that will meet your every need. 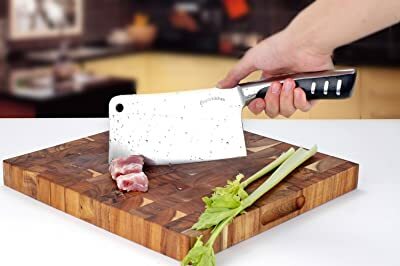 After all, butcher knives have become multi-purpose blade tools – so you can also use them for doing your regular cooking chores in the kitchen. This model of Winco butcher knife is a cleaver type. Length – The blade is 8 inches long and 3.5 inches wide. Materials – Its blade is made of stainless steel materials. Handle Design – It comes with a 5-inch long wooden handle. Multi-Functional Design – As a butcher knife, it can be used for butchering, chopping, slicing, etc. You can also use it for your basic kitchen needs like crushing garlic. Cleaning Procedure – It’s dishwasher safe. It’s a versatile all-around butcher/ kitchen knife. It has a heavy-duty feel to it. 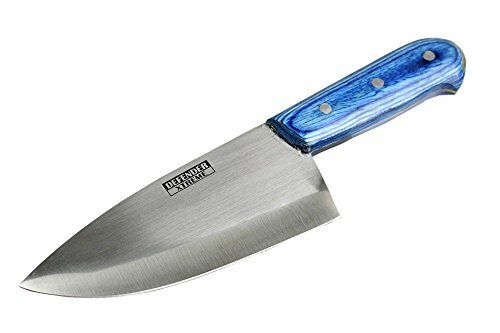 Since this is a very inexpensive knife, the quality may not be that good. I like the overall design of this butcher knife, and I also like the price (it’s very cheap). It can perform well, but I suggest handling it with care so that it will last a long time. This model of a knife from Utopia Kitchen is a cleaver/ chopper type of butcher knife. Length – The blade on this knife measures 7 inches long. Materials – Its blade is made of stainless steel. Handle Design – It comes with the ergonomically designed handle for a comfortable grip. Multi-Functional Design – It can cut, chop, slice, dice, etc. Cleaning Procedure – Hand wash it or put it in the dishwasher. This is a great butcher knife for commercial and home use. It can chop and cut tough meat, even bones. You can also use it on hard fruits and vegetables like squash, melon, and pineapple. This Ontario butcher knife comes in the form of a utility knife. It’s great for outdoor use. Length – The blade measures 7 inches in length and the handle is about 4.5 inches long. Materials – It’s made of carbon steel materials. Handle Design – It comes with a hardwood handle with “Old Hickory” brand. The wooden handle is held by 2 rivets. Blade Design – This is a full tang knife. It’s made of high-quality materials. I really like this knife because it’s good looking and durable as well. Just take good care of it by hand washing it, drying it up quickly, and applying oil before storing it – and it will surely serve you well for a long time. This butcher knife from Rada Cutlery comes in a paring knife style. Length – The blade is 5 3/8 long and the handle is about 4 inches long. Materials – The blade is made of stainless steel. Cleaning Procedure – It’s dishwasher safe, but hand washing it is highly recommended. The total length is not very long, so it’s easy to handle. It’s a multi-functional butcher knife that can handle a lot of jobs in the kitchen. It can get dull quickly with frequent use – so, expect to sharpen it often. The size of this knife makes it easy to use for cutting, slicing, skinning, etc. It’s also very affordable. The Ontario knife 7111 is an all-around butcher knife. Length – The blade on this knife measures 10 inches long. Materials – The blade is made of carbon steel materials. Handle Design – The handle is made of “Old Hickory” wood with 2 rivets. Multi-Functional Design – This butcher knife is great for cutting, dicing, grilling, etc. Cleaning Procedure – Use hot soapy water to hand wash it, and then season it with oil after drying it up. It is capable of making thin slices. It’s easy to use and manipulate. Sharpening the unit (when needed) is easy. It makes for a great grilling knife. This is a long, all-around butcher knife. Because of its length, it is capable of handling a lot of cutting and slicing jobs. If you take good care of it, it will be a great companion in the kitchen and outdoors as well. As butcher knives come in many different shapes and sizes, I actually recommend all the knives included in this Top 5 list – just get the ones that you need. Personally, I like the Winco butcher knife because it’s the right size and length (8 inches blade) for a classic butcher knife. The Utopia model is also good, but it’s shorter (7 inches blade) and a little bit more expensive than the Winco knife. The Ontario 7025 butcher knife also makes for a fine choice. It’s an all-around utility knife that can be used indoors and outdoors. Like I said, all the products included in this article are good – and they’re suitable for different needs. I also made it a point that I picked reasonably priced products to present to you in this review post. So, good luck with your search – and I will be waiting for your feedback. 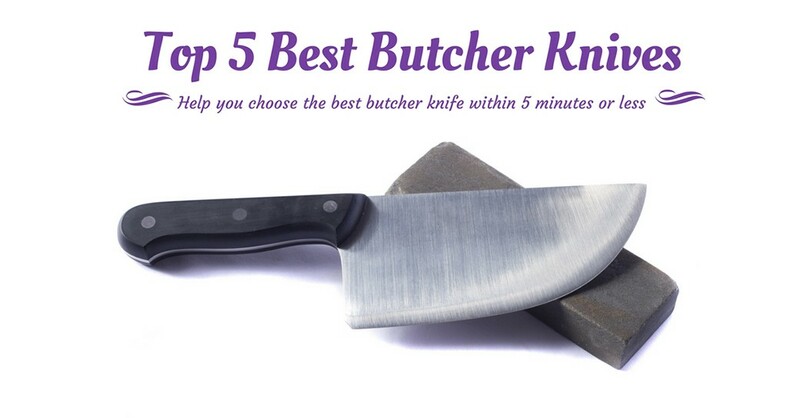 Don’t forget to share this article on the best butcher knives with your friends! For more knives like meat cutting knives, boning knives, carving knives, electric knives and slicer, check out this page and you won't regret it .